Food Costs > How Much Do Strawberries Cost? How Much Do Strawberries Cost? 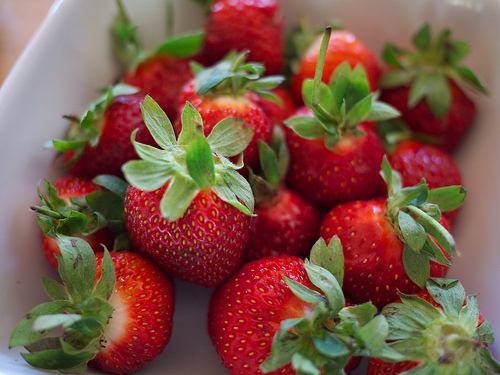 Strawberries, which are free from fat, sodium and cholesterol, are an amazing source of fiber, vitamin C and folate. On average, fresh strawberries, usually outsourced out of state, are going to cost $1 to $4 per pound depending on the season. The costs really depend on the time of year, geographical location, quantity and where they are purchased. The summer months, when strawberries are in season, the costs are often as little as $0.75 if on sale to close to $2 per pound. If the strawberries were to come from a local farm within 50 miles, then the prices may be twice the amount mentioned, even if in season. A flat, for example, which is often found at a local berry farm, could cost about $30 for a flat or about $17 for a half flat. A pint can cost about $3 to $5, while three pints may be a pinch less than $10. A frozen bag of strawberries can cost close to $2 for a 16-ounce bag to as much as $10 for a 64-ounce bag. At Trader Joe’s, for example, a two-pound container retails for $4.79, but this price may vary by region, according to the website. This price is good for the east coast, midwest, and southeast. When checking Walmart’s online grocery pickup prices, the cost of strawberries was $1.98 per pound. This USDA report, as of 2013, says the average price for fresh strawberries was $2.36 per pound, while frozen was only two cents more. Strawberries commonly purchased at a grocery store will either come in a 16- or 32-ounce container. One pound of strawberries contains 151 calories, no fat, no cholesterol, no sodium, 34 grams of carbohydrates, 3.8 grams of fiber and 22.7 grams of sugar. When picking out strawberries at a local store, look for a shiny, firm and bright red berry with a fresh-looking green intact cap. In a pound of strawberries, you can expect 15 to 20 medium-sized berries or close to two cups. In a pint, it will yield about two cups of sliced berries, according to HowMuchIsIn.com. The summer months are often the best months to buy strawberries for less than $1 a pound. If you have a handful of grocery stores in your area, be sure to compare the circular ads to see which grocery stores are offering the best deals. Any price under $1 per pound is deemed a good deal by most. In some cases, frozen strawberries may be cheaper than fresh strawberries. Depending on the reasons for purchase, frozen strawberries can work just as well. Check out a local farmers market, or if you live in an area good for strawberries, consider a U-pick farm. Local markets are often cheaper and can taste much better. A U-pick farm, depending on your location, could cost about $10 to $15 per gallon bucket or about $1 to $2 per pound. Buying in bulk at your local wholesale clubs, such as Costco and Sam’s Club, can bring the costs down. Thrifty shoppers highly recommend checking out your local Aldi or 99 cent store for cheap strawberries. If purchasing frozen, consider the store brand to save up to 30 percent.